In just the past two years researcher Etheresia Pretorius at the University of Pretoria in South Africa has published a flurry of reports that may turn modern medicine on its ear. Iron overload, as evidenced by elevated iron storage levels (ferritin blood test) as well as excess copper can generate the dreaded hydroxyl radical, the most destructive oxidizing agent in the body. A decade ago it was shown that fibrin clots initiate the sprouting of abnormal blood vessels (called neovascularization) and that anti-clotting agents are potential inhibitors of these abnormal blood vessels. [Thrombosis Haemostasis Aug 2004] This occurs in wet macular degeneration and diabetic retinopathy. 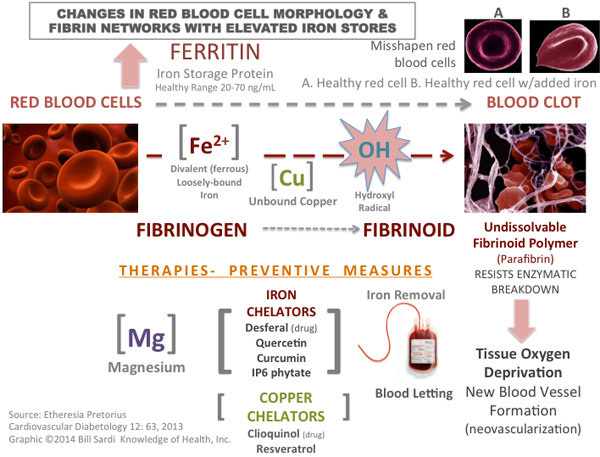 So the problem of insoluble blood clots was well described decades ago but the origin of the problem remained obscure until Dr. Pretorius and colleagues fingered loosely bound or unbound iron and copper as the instigators of unremitting fibrin clots. Or were they the first? There was no need to develop new iron-chelating drugs in 1983. Turmeric spice that provides curcumin, rice bran that provides IP6 and apple peel that provides quercetin, all natural iron chelators, were available for extraction. How many lives would have been saved from mortal heart attacks caused by the insoluble blood clots in coronary arteries over the past three decades if cardiologists had utilized natural remedies to prevent clots instead of expensive blood thinners that inappropriately depleted vitamin K instead of iron? Commercial interests have taken over the practice of medicine. Measures that truly prevent disease from occurring in the first place as shunned for expensive treatments that do not address the cause of the problem and leave patients in chronic ill health. Will practicing physicians in the USA take heed and begin using natural molecules to prevent morbid and deadly blood clots? They haven’t addressed the iron problem since it was first reported over 30 years ago. Dr. Pretorius is already facing opposition to her work. She wants to halt transfusions of “rusty” misshapen red blood cells obtained from iron-overloaded subjects. The Superior Health Council in Belgium opposed the idea. — ©2014 Bill Sardi, Knowledge of Health, Inc.